Following a healthy diet requires a basic understanding of nutrition, eating behavior and the influence of your diet on mental and physical well-being. Eating healthily can help you lose weight, as well as provide a collection of fundamental improvements to your health. The basics of healthy eating can be learned in just a few minutes and should prove enormously helpful as you make healthy diet decisions during medical weight loss. Your diet is dependent on your eating behaviors. These include the food choices you make, as well as your response to hunger cues, when you eat and how much you choose to eat. While the word “diet” is traditionally used to describe a temporary change in eating habits that encourages weight loss, a healthy diet is a long-term shift that involves fundamental changes to your eating behaviors that encourage ongoing health and well-being. Your body depends on the foods you eat to supply it with nutrients, chemicals and substances that act as a fuel source for bodily functions, like cognition, metabolism and energy. Nutrients from foods are essential for optimal functioning and growth. A well-balanced diet includes all six of these nutrients. When we don’t get these nutrients, our bodies will start to systematically shut down in what is called a nutritional deficiency. Dehydration is an example of a nutritional deficiency that happens when you do not consume enough water. Eating plenty of whole foods. These are natural foods that are comprised of a single ingredient. Examples include fruits, vegetables, meats, nuts and some grains like rice. Switching to whole grains. Try to reduce refined grains like sugar and white bread by replacing them with whole grain brown rice and whole wheat bread. Whole grains are rich in fiber, which encourages metabolic health and improves digestion. Drinking water. Aim to drink 64 ounces of water every day to stay hydrated. While other beverages can prevent dehydration, they often have calories and sugar. Avoid high-sugar juices and sodas. As you create a healthy diet, try to focus on the nutrients that you are gaining—not the foods that you are eliminating. This can help you keep a positive attitude about developing a healthy diet. 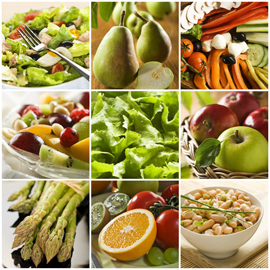 Following a healthy diet provides significant health advantages. Eating a well-balanced diet reduces your risk of chronic diseases like type-2 diabetes and heart disease. Good nutrition also helps to stabilize cholesterol and blood sugar levels. Eating a healthy diet can naturally boost energy, improve your mood and help you sleep better.